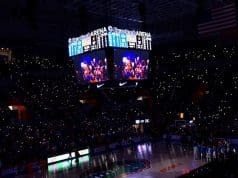 The Florida Gators coaching staff has moved its attention to the 2019 class after closing out the 2018 class strong earlier this month. 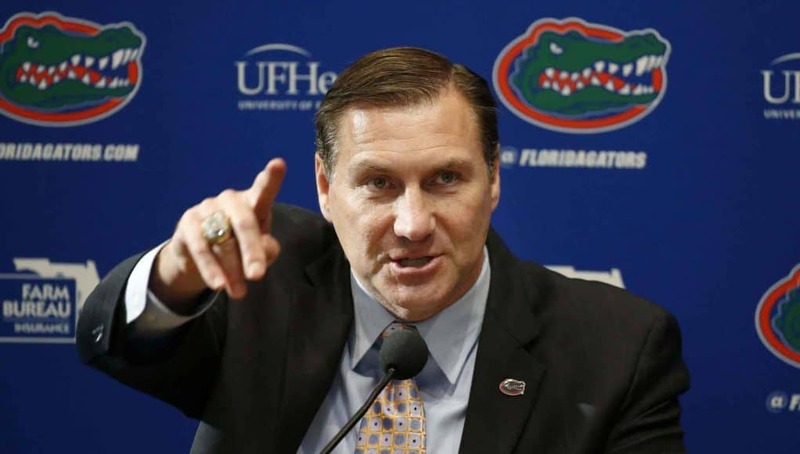 Dan Mullen and the coaching staff have sent out a lot of offers already to the 2019 class and visited a lot of those during the recruiting period in January. 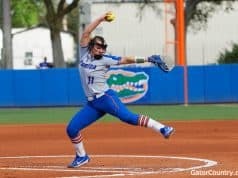 GatorCountry brings you a look at some of the targets on the board on the offensive side of the ball and we will follow that up with the defensive side of the ball on Tuesday. 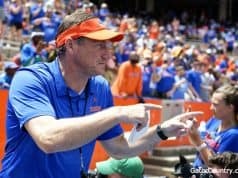 The Gators have eight quarterbacks in the 2019 class and right now it looks like they will take just one at the position but that could change as signing day 2019 gets closer. Here’s a look at some guys to keep an eye on. David Baldwin (6-4, 214, Bradenton, FL. IMG) is originally from California before moving to IMG this year. Baldwin has picked up a several big offers as of late and the Gators have been recruiting him hard including visiting IMG several times to see him and several teammates. Sam Howell (6-2, 217, Monroe, NC. Sun Valley) has had a huge 2018 that has included getting offers from the likes of Alabama, Florida, Miami, Notre Dame among others. Clemson looks to be the team to beat early on but Howell admits that he wants to visit Florida. Jalon Jones (6-3, 180, Baltimore, MD. St. Frances Academy) was once committed to Mullen at Mississippi State but decomitted once he came to Florida. Jones says he wants to visit Florida and his relationship with Mullen is very strong. The Gators are definitely a team to watch with Jones. Taulia Tagovailoa (5-11, 202, Alabaster, AL. Thompson) is the younger brother of Alabama quarterback Tua Tagovailoa so the Crimson Tide are the team to beat but the younger brother has said he wants to take visits and make his own decision. Florida has one of the deepest running back rooms in the country and they will likely sign just one next year but they could go for two depending on the numbers. Trey Sanders (5-11, 216, Bradenton, FL. IMG) was once committed to Alabama but decomitted and he has visited the Gators a few times in the past. Sanders is also a huge priority for the Gators. Florida State and Alabama are also pushing hard for Sanders who is considered one of the top backs in the country for 2019. Noah Cain (5-11, 207, Bradenton, FL. IMG) has an offer list with just about every major program on it and he will have his choice of where to attend school at. Cain admits that he likes Dan Mullen and the Gators and plans to visit but Ohio State, Miami and Penn State are also very strongly in the mix. Expect Cain’s recruitment to go on for awhile. Marcus Crowley (6-1, 200, Jacksonville, FL. Trinity Christian) is committed to Miami but Crowley tells GC that he plans to visit Gainesville for a junior day this spring. Crowley has seen his recruitment blow up as of late and the Gators are one of the teams hard after him. Quavaris Crouch (6-2, 224, Charlotte, NC. Harding University) is considered the one of the nations top running back in the country and the Gators offered in January. Crouch is a distant cousin of Gators defensive tackle Marlon Dunlap who transferred to Florida from North Carolina. After signing just one true freshman receiver, the Gators will look to add two-three more next year and instate the talent is there. John Dunmore (6-2, 172, Hollywood, FL. Chaminade-Madonna Prep) was committed to Florida at one time but decomitted with the coaching change but says he’s still interested in the Gators. Dunmore also has a lot of interest in Florida State a team he grew up rooting for. Maurice Goolsby (6-5, 196, Dunellon, FL. High) the once Gators commit can play either receiver or tight end but one thing is for sure and that’s Florida is still on his mind despite his decommitment. Goolsby received a visit from Florida in January and look for him to return for another visit. Trey Knox (6-4, 206, Murfreesboro, TN. Blackman)has visited Florida a lot in the past and if this Gators staff goes after him hard then watch out for Florida here because he and his family like the Gators. Ohio State is another team to watch for Knox. Frank Ladson (6-4, 170, Homestead, FL. South Dade) another once Gators commit who still has Florida in the mix as well as Miami and Florida State. The Gators will have to battle those three teams down the stretch. Jeremiah Payton (6-3, 180, Neptune Beach, FL. Duncan Fletcher) has picked up about every SEC offer you would want lately including one from the Gators. Payton tells GC that he wants to visit Florida this spring after he recently visited Auburn. Mark Richards (6-1, 194, West Palm Beach, FL. Wellington) plans to visit Florida for junior day and while his brother is a receiver at Miami, the younger Richards says he wants to make his own decision. Florida has been a school after Richards hard lately. Jordan Whittington (6-1, 198, Cuero, TX. High) has long talked about Florida but the Gators will have to beat out instate competition in Texas and Texas A&M for Whittington who has visited in the past. After the Gator signed two in 2018, Florida could get away with signing just one in the 2019 class and they have a good one instate. Keon Zipperer (6-2, 240, Lakeland, FL. High) is one of the Gators top targets and Florida visited his school multiple times in January to see him. Zipperer is considered one of the top guys instate for next year and Florida is in good shape early on. Jackson Lowe (6-5, 242, Cartersville, GA. High) was offered by Florida in January and he has had a big last few weeks by picking up offers from Georgia, Notre Dame among others. Lowe says he’s still learning more about the new coaching staff. The Gators signed four offensive linemen in 2018 but look for them to again sign a big class and they have plenty of top options on the board. Carter Colquitt (6-6, 295, Buford, GA. High) visited the Gators in January and loved his visit with the new coaching staff. Colquitt has Auburn high on his list as well as the Gators right now. Deyavie Hammond (6-4, 320, Bradenton, FL. IMG) is from Lakeland and the Gators are a team heavily in the mix for him after he recently decomitted from Alabama. Hammond is considered one of the top prospects in the state for next year. Look for the Gators to get him on campus this spring. Keiondre Jones (6-4, 315, Hogansville, GA.) Callaway) is the cousin of Florida signee Emory Jones and he plans to visit Florida this spring. Georgia is fighting to keep Jones instate but the Gators are a team to watch. Dontae Lucas (6-3, 323, Bradenton, FL. IMG) has visited Florida several times in the past under the last coaching staff. Right now Lucas looks to be a battle between the big three in Florida with Miami having the early edge as he’s South Florida native. Warren McClendon (6-5, 290, Brunswick, GA. High) has Georgia, Alabama, Auburn and Florida are recruiting him hard and is one of the best in the state of Georgia for next year. McClendon visited the Gators last summer and plans to return for another visit under Mullen. Harry Miller (6-4, 310, Buford, GA. High) has a list of offers including Florida, Georgia and Ohio State. Miller is also high academic guy and has gained interest from Stanford and Notre Dame early on. Evan Neal (6-7, 378, Bradenton, FL. IMG) once committed to Alabama but decomitted this past fall. Neal is one of the top lineman in the country and has a list of schools after him. Miami and Florida State are also heavily in the mix for Neal. William Putnam (6-4, 280, Tampa, FL. Plant) is originally from Ohio which gives the Buckeyes of Ohio State the early lead. Putnam however admits that he wants to visit the Gators but watch out for Notre Dame as a surprise team here. Wardrick Wilson (6-4, 295, Miami, FL. Norland) committed to Florida last July and has remained committed despite the coaching change. Wilson admits that the Gators are still getting to know him and vice versa but he plans to visit Gainesville to see the new staff.